Smelly pits. We’ve all been there. The scent can hit you after a grueling workout or in the middle of a nerve-wracking presentation. For some lucky people, a couple of swipes of deodorant are enough to cover the evidence. But sometimes, no matter how much you shower, douse yourself in perfume or slather on deodorant, the stink just won’t let up. It’s hard to exude confidence when you’re constantly trying to keep your arms down to hide the embarrassing odor. Luckily, we’ve broken down the best ways to get rid of armpit odor. Contrary to popular belief, sweat by itself doesn’t smell. When your sweat interacts with the bacteria on your skin, it produces that unmistakable odor — also known as BO. The medical term for chronic armpit odor is bromhidrosis. Body odor is sometimes the result of a medical condition that should be addressed by a doctor — but for many people, simple lifestyle changes and home remedies can help cure smelly pits. Read more about the different causes of body odor. Here are the best and easiest methods for getting rid of armpit odor fast. These versatile home remedies for body odor can help combat B.O. without breaking the bank – and you can find most of them in your kitchen or local grocery store. Witch hazel is a natural astringent, which means it contracts your skin’s tissues and reduces the production of sweat. Most commercial witch hazel extracts also include rubbing alcohol, which helps fight odor-causing bacteria that like to hang out in your armpits. Fight back against armpit odor by dousing a cotton ball with witch hazel and rubbing it on your underarms after showering or bathing for an easy-to-apply home remedy for body odor. Apple cider vinegar is naturally acidic and has antimicrobial properties. You can find this home remedy for body odor in the grocery store. It neutralizes the environment in your underarm area and destroys smelly bacteria. Using apple cider vinegar regularly can help prevent bacteria from accumulating in your armpits. Dip a cotton ball in a small bowl of apple cider vinegar and apply it to your underarms twice a day. Lemon juice is another highly acidic ingredient that doubles as a home remedy for body odor. It reduces the pH of your skin and makes it uninhabitable for bacteria. Natural deodorant is a gentle, healthy home remedy for body odor. It’s a great alternative to standard deodorant options that contain potentially harmful chemicals. Most natural deodorants are gentle on the skin and free of aluminum, parabens and phthalates. If regular deodorant makes your skin itch or burn, the natural deodorant route might be your best bet for fighting armpit odor. Did you know that certain foods can intensify armpit odor? If you’re prone to bad B.O., try laying off these foods for a few days. Broccoli, cabbage, Brussels sprouts and cauliflower contain sulfur, which your body absorbs and secretes through your sweat. Eating these veggies can impact your body odor for one to six hours. Meat is harder to digest than other foods, so your body has to work harder to process it. The amino acids in red meat leave a residue in your intestines. Your intestinal enzymes break down the residue during digestion, which mixes with bacteria on your skin and intensifies your body odor. Fish like tuna and salmon contain choline, a type of B-vitamin that produces a pungent fishy smell. Some people who eat fish can secrete choline in their sweat for up to a day. It might be time to take a good, hard look at your personal care routine. Practicing good hygiene can help reduce the number of bacteria in your armpits. Do you have a bad habit of re-wearing sweaty workout clothes between washes? Letting sweat sit on your shirts creates a breeding ground for sweat-causing bacteria. Wear a fresh shirt every time you go out or exercise, and wash your clothes immediately after a heavy sweat session. Shower at least once a day and scrub your extra-sweaty areas with a scent-free, antibacterial bath soap. Stay away from strongly scented soaps, which can make your armpit odor worse. If you exercise often, make sure to shower right after every workout so bacteria don’t have a chance to spread. What’s the best way to guarantee your friends, family and colleagues never know you’re battling armpit odor? Wear a sweat proof undershirt like the Thompson Tee. The Thompson Tee’s Hydro-Shield sweat-proof technology completely absorbs moisture and prevents armpit odor and sweat marks from reaching your outer layer. 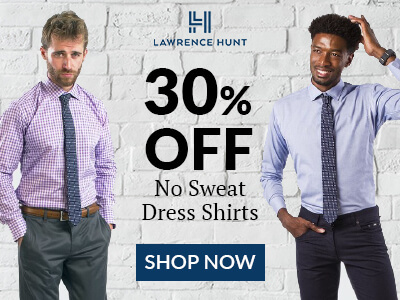 It comes in a variety of colors and styles and layers effortlessly under any dress shirt or uniform. Arm yourself with a Thompson Tee and stay confident and odor-free all day, every day.